The plight of baseball players like Allen Richter was an all too common theme in the 1950s. Labeled as one of the best shortstops of his era in the minor leagues, Richter treaded water in the Boston Red Sox farm system while Johnny Pesky cemented his position as a franchise cornerstone. Bound to the Red Sox by the reserve clause and his path effectively blocked by Pesky, Richter played his best baseball away from the Major League spotlight, appearing in only six games during two separate stints in Boston. While Richter’s major league career never fully materialized, he outlived most of his Boston counterparts, remaining active by playing tennis a few times per week into his late 80s. Sadly, Richter passed away October 29th, 2017 at his home in Virginia Beach, Virginia. He was 90. The Red Sox signed Richter in 1945 from Maury High School, where they placed him with their team in Roanoke. His time with the club was short lived, as he only played three games before he fulfilled his military duties in the Army Air Corps. Richter returned to the Red Sox in 1947 and he moved briskly through their farm system, reaching Triple-A by 1949. He impressed with his eye at the plate, walking 100 times in 1950, while only striking out 36 times in 589 plate appearances. He took pride in the fact that he consistently put the ball in play. 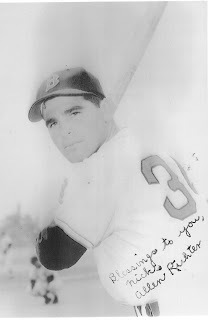 Richter had his breakout season in 1951 batting .321 with Louisville while carving a niche as one of the top shortstops in the American Association. His teammates took notice of his tremendous play, including Charlie Maxwell who was another young talent that later joined Richter in Boston. Tearing up the American Association in 1951, Richter forced the Red Sox hand, as they called him up when rosters expanded in September. They were in the heat of a pennant race with the New York Yankees, so he had to wait until their fate was determined until he was able to make a start at shortstop. Manager Pinky Higgins placed Richter in the starting lineup during the last game of the season with many of the other Red Sox rookies. He responded by getting his first major league hit off of Eddie Lopat, a memory that was crystal clear more than 50 years later. Richter’s lone hit capped a promising season, giving him a glimmer of hope for a return to Boston; however, those dreams were quickly dashed when they sent him to San Diego in the Pacific Coast League for the 1952 season. The Red Sox brought him back for one more appearance as a defensive replacement in 1953 and two years after that Richter was out of baseball at 28. During our 2009 interview, he explained how frustrating it was for players in his situation due to baseball's reserve clause. After his baseball career, Richter transitioned to becoming a television sports reporter in Virginia. He later moved on to careers in the real estate and food service businesses. Richter was honored in 2012 by the Boston Red Sox when they invited him back to Fenway Park to take part in the franchise’s 100th anniversary celebration of the legendary stadium. Even though his time with the franchise was brief, he held the experience in the highest regard. "It was just a privilege to have been around so many great players," Richter said to the Virginian Pilot in 2012, "and it will be a privilege to share a little in the history of a special place."